The average mouth can comfortably fit 28 teeth. When the third and final set of molars – commonly known as “wisdom teeth” – begin to develop, the addition of 4 more teeth in an already full mouth can cause varying levels of discomfort. In order to prevent this pain, many people have their wisdom teeth removed. For some people, wisdom teeth do not have to be extracted. If they align properly and the gum tissue is healthy, they can remain in your jaw without causing pain and discomfort. However, this is not always the case. Wisdom teeth become problematic when they are misaligned. They can grow in sideways, angled toward or away from the second molars, or angled inward or outward. Poor alignment can crowd and damage adjacent teeth, the jawbone, or surrounding nerves. “Impacted” wisdom teeth are those that remain trapped beneath the gum and bone. Poorly positioned impacted teeth can cause pressure that may move and disrupt the orthodontic or natural alignment of teeth. How do I know if my wisdom teeth should be removed? An oral examination will allow our oral surgeons to evaluate the position of your wisdom teeth in order to predict any future complications. The earlier you have your wisdom teeth evaluated and treated, the better the outcome will be. Most patients are first assessed by a dentist, orthodontist, or oral surgeon in their mid-teens. 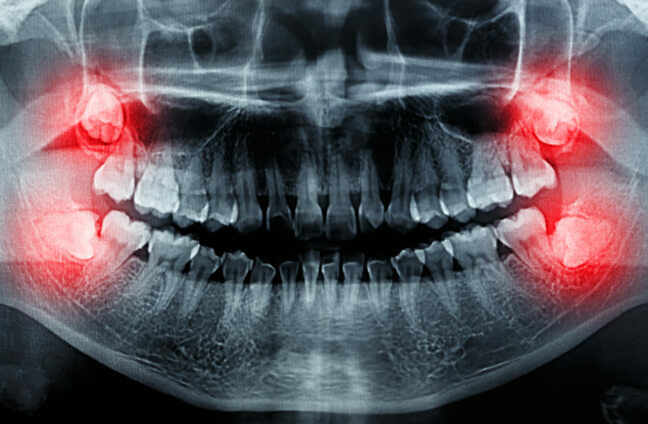 What should I expect from wisdom tooth extraction surgery? In most cases, wisdom teeth are removed under local anesthesia, laughing gas, or general anesthesia to maximize patient comfort. We offer various types of anesthesia and will work with you to select the best option for your individual case. Our oral surgeons will discuss these options with you prior to the procedure. Our services are provided in an environment of optimal safety, with up-to-date equipment operated by a staff that is experienced in anesthesia techniques. Once your wisdom teeth are removed, the gum is sutured and gauze will be placed in your mouth to help control bleeding. You’ll remain in the office under the supervision of our staff until you are ready to be taken home. We’ll provide you with a post-operative kit including instructions for care once you are home, a prescription for pain medication and antibiotics, and a return appointment for the following week to have your sutures removed. How long is recovery from wisdom tooth extraction surgery? Your specific recovery will depend on many factors including your age, overall health, and the difficulty of the extraction. Most patients will experience some swelling and mild discomfort after surgery, and you will be limited to a soft diet until the discomfort passes. If necessary, you may be prescribed antibiotics or pain medications. How can I find out more about wisdom teeth extraction? For more information on wisdom teeth extraction, please contact Staten Island Oral & Maxillofacial Surgery to schedule an appointment with oral and maxillofacial surgeons David Hoffman, D.D.S., F.A.C.S., Lydia J. Lam, D.D.S., Steve Yusupov, D.D.S., M.D., and Mark Stein, D.D.S., M.D. at 718.226.1251.